A routine dental checkup is more than just cleaning your teeth. 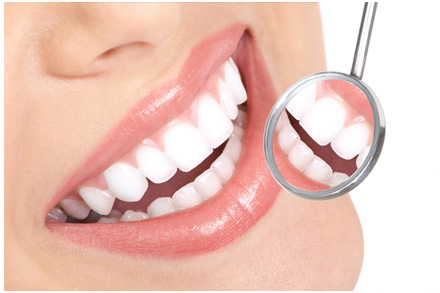 We check for tooth decay, plaque and tartar build-up, and gum disease. We also check for oral cancer. We now know that the health of your mouth can affect your overall health. Poor oral health has been linked to an increased risk for heart attack or stroke, uncontrolled diabetes, respiratory disease, and low birth weight or pre-term babies. Regular maintenance appointments are vital to good oral health, general health and maintaining a beautiful healthy smile for a lifetime. Periodontal disease is an infection of the teeth, gums and bone that surrounds the teeth. It is the leading cause of tooth loss. It used to be thought that the loss of the teeth is a normal process. We now know that periodontal disease is caused by bacteria in plaque that invade the space between the teeth and gums. These bacteria produce toxins that cause the body to react with inflammation. The effect is the destruction of bone surrounding the teeth which if left untreated will lead to the loss of teeth. The other concern is the affect that periodontal disease has on your general health. It is now known that periodontal bacteria can enter the bloodstream and travel to major organs. It has been linked with osteoporosis, heart disease and stroke, pregnancy problems, diabetes and respiratory disease. With an early diagnosis and regular maintenance, periodontal disease can be treated. The frequency of your continuing care appointments will depend on the severity of the disease, your home care, and how well your body responds to therapy. Oral Cancer is not a rare disease. More than 34,000 Americans are diagnosed with oral or pharyngeal cancer every year – over 100 new cases each day! Only about 50% will survive 5 years. It kills one person every hour of the day. The reason for the low survival rate is due to the late detection of the disease after it has spread to the lymph nodes. Because this cancer is painless in its early stages, it is only through opportunistic screenings by a knowledgeable professional that the disease can be found at early stages – when the survival is greatest and treatment morbidity is kept to a minimum. We do regular screenings for oral and pharyngeal cancer to help detect it in its earliest stage so that it can be very successfully treated. We urge you to learn more about this disease at www.oralcancer.org.